Shazwani Hamid's Blog: Every Girl's Dream! Imagine..having lots and lots of spaces for your clothes, and your shoes, and your bags..etc! Oh goshh.. Just thinking about it, makes me so excited! hehe.. There'll be no more wardrobe malfunction! - My closet behaves more like a black giant hole in which my clothes seems to just disappear within! Sigh.. It just makes clothes preservation easy. And plus, it provides maximum convenience to change your clothes with everything that you will need close by! Ahhh... There is nothing better than being able to get dressed with ease! Imagine...having a lot of space to hang your clothes, your shoes, your bags, your little items..and so on.. and with some big fat giant full-length mirror in it, and extra, extra space to stand around them and do your business while lingering on that pretty little things of yours!! Ahhh...bliss! However, Carrie from SATC's closet is still my number one choice! Simple yet amazing! I likeee! It is a rectangular room with doors in the narrow sides. The one door is the entry from the bedroom and the other goes straight to the bathroom. I would love to have this kinda room! It's perfect! Why I love this closet, is because it has a one side for masculine's closet and another side for herself! I find it so cute, and sweet!! And then, in the middle of the room, there is a central zone with down-scent spot lights, just over the daybed. Over these spots there is the hidden lighting also...which makes the room appear glowy and glossy.. and look SO pleasant! I really think lighting contributes greatly to the look and feel of a room! Anyway...let's drool over some closets that I like..
Everything is kept inside that wardrobe.. I can't see what's inside it.. Hmm..I wonder what clothes and shoes inside there! Btw, I like the zebra printed couch, and that purple rug. It's cute! Ahh..this one. Posh meets Glamour. I think this room has a feeling of luxury.. 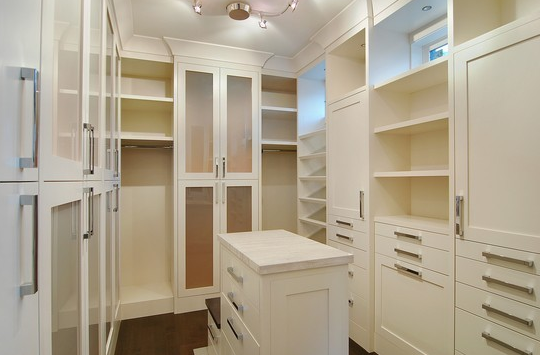 I don't know why, but there's just something about ivory wardrobe and closet, that gives the room a little poshy feeling.. This one..I can't see the whole room, but I like how she arranged her stuff in here! It's pretty! And lastly... one of my favourites! Bestnya kalau ada. 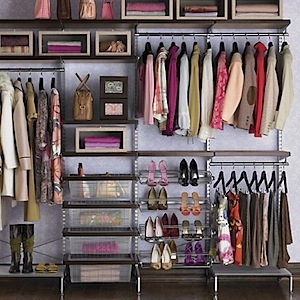 Memang semua wanita inginkannya..
alyza: i bet it's every girl's dream to get these wardrobes kan! why u always want to follow your sister? I have read this post in your sister's blog last month, if Im not mistaken. but for sure thingking of reading in your sister's blog is not a mistake. anonymous: LOL. Y r u so serious babe? relaxxx..hehe..